Public Discussion: Where are the Utopian Visionaries? Please join us for the reception and panel discussion "Where are the Utopian Visionaries? 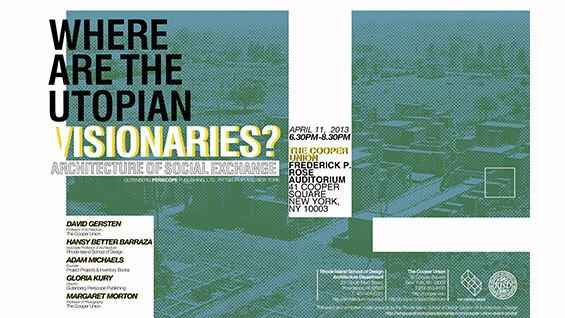 Architecture of Social Exchange" on Thursday, April 11th, 6:30– 8:30pm at The Cooper Union - Frederick P. Rose Auditorium. This panel discussion, drawing content from a recent publication entitled Where are the Utopian Visionaries? Architecture of Social Exchange, edited by Hansy Better Barraza, aims to showcase the work of contemporary architects, designers, and thinkers who continue to address one of the most poignant questions of our time: what is the role of social and community building in the practice of architecture? Panelists include David Gersten, architect and Professor of Architecture at The Cooper Union; Hansy Better Barraza, practicing architect and Associate Professor at the Rhode Island School of Design; Adam Michaels, founder of Project Projects & Inventory Books; Gloria Kury, publisher and director of Gutenberg Periscope Publishing, an independent press for art and architecture; and Margaret Morton, Photographer and Professor at The Cooper Union. Gloria Kury will introduce the speakers and the discussion will be moderated by David Gersten. Panelist bios: David Gersten is a contributor, panelist and will moderate the discussion. David is a Professor in the Irwin S. Chanin School of Architecture at the Cooper Union for the Advancement of Science and Art. Gersten has been a visiting professor and guest critic at universities throughout Europe and the Americas. The Canadian Center for Architecture, among other public and private collections, has acquired his widely exhibited drawings and constructions. His work has also appeared in many publications, including RES: Anthropology and Aesthetics. Hunting Life: A Forever House is a museum edition of his drawings and stories. Hansy Better Barraza is the editor of the book and panelist. She is an Associate Professor of Architecture at the Rhode Island School of Design and a practicing architect in Boston. She serves on the Board of Directors as Secretary for the Boston Society of Architects and is on the editorial board for the Critical Productive Journal examining the intersection of architecture, culture and theory. Studio Luz Architects, the firm she cofounded with Anthony Piermarini, has been featured in national and international exhibits and publications. In 2011 she cofounded BR-A-CE: Building Research–Architecture–Community Exchange, a non-profit corporation dedicated to creating new community spaces. Adam Michaels of Project Projects, designed the publication and is a panelist. Michaels is the cofounder of New York-based design studio Project Projects, and the founder of Inventory Books, an imprint published by Princeton Architectural Press. His work focuses on the active synthesis of typography and images -- and editorial and design work -- as a means of conveying socially relevant material to diverse audiences. Project Projects works on books, exhibitions, identity systems, and websites with clients such as the Canadian Centre for Architecture, Harvard Graduate School of Design, MoMA, SALT Istanbul, and Steven Holl Architects, and has been chosen twice as a Finalist for the Cooper-Hewitt National Design Awards. The studio's work has been widely published, and its principals have lectured and taught both nationally and internationally. The third and most recent title in the Inventory Books series is The Electric Information Age Book: McLuhan / Agel / Fiore and the Experimental Paperback, by Jeffrey T. Schnapp and Adam Michaels, which was further elaborated upon as a full-length vinyl LP entitled The Electric Information Age Album. Gloria Kury is providing us with the introductory comments and will join us on the discussion. Gloria is the publisher and director of Gutenberg Periscope Publishing, Ltd., an independent press for art and architecture founded in 2007. She has a PhD in art history from Yale and has taught art history at the School of Visual Arts, New York University, Vassar College, and Yale University. She has also served as the director of the Yale Summer School of Music and Art in Norfolk, Connecticut. Margaret Morton is a contributor and panelist. Margaret Morton is Professor of Photography at The Cooper Union. Morton's four published books underscore her twenty-year engagement with the photographic representation of alternative built environments and form a permanent record of the temporary habitats that Manhattan’s homeless individuals created for themselves in public parks, vacant lots, abandoned buildings, along the waterfronts and beneath the city’s streets: Fragile Dwelling (Aperture Foundation), The Tunnel: The Underground Homeless of New York City (Yale Press; Schirmer/Mosel, Germany), Transitory Gardens, Uprooted Lives, co-authored with Diana Balmori, (Yale Press), Glass House (Penn State Press). Morton’s recent work includes projects in Manhattan, Kyrgyzstan, Ukraine, and Argentina. Morton’s photographs have been presented in more than eighty exhibitions throughout the world. Her exhibitions and books have been reviewed in The New York Times, The New Yorker, and U.S. News & World Report and international publications: Art Forum, The Times and Evening Standard (London); Die Zeit, Zeitmagazin, Der Spiegel, (Germany); and Asahi (Tokyo).